1.3. Detonations, Deflagrations, and Runaways. 1.4. Assessment and Testing Strategies. Chapter 2. Identification of Hazardous Chemical Reactivity. 2.1.4. Experimental Thermal and Reactivity Measurements. 2.1.6. Overview of Thermal Stability Test methods. 2.1.7. Examples of Interpretation and Application of Test Data. 2.2.2. Identification of High Energy Substances. 2.2.3. Hazard Prediction by Thermodynamic Calculations. 2.2.3.2. Calculation of the Reaction Enthalpy. 2.2.3.3. Application of Computer Programs. 2.2.4.4. Reactions between Halogenated Hydrocarbons and Metals. 2.3.2. Thermal Stability and Runaway Testing. 2.3.2.2. Dewar Flask Testing and Adiabatic Storage Tests. 2.3.2.3. Accelerating Rate Calorimeter (ARC). 2.3.2.4. Stability Tests for Powders. 2.3.3.2. Deflagration Testing and Autoclave Testing. 2.3.3.4. Sensitivity to heating Under Confinement. Chapter 3. 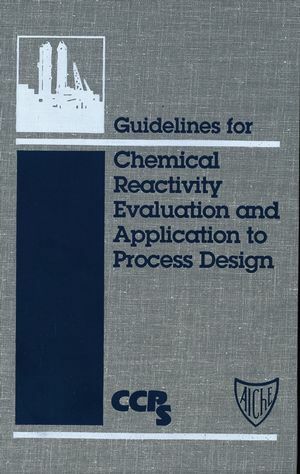 Chemical Reactivity Considerations in Process/Reactor Design and Operation. 3.1.1. Thermal Hazards: Identification and Analysis. 3.1.1.1. Cause, Definition, and Prevention of a Runaway. 3.1.1.2. Some Simple Rules for Inherent Safety. 3.1.1.3. Strategy for Inherent Safety in Design and Operation. 3.1.1.4. Equipment to be Used for the Analysis of Hazards. 3.2. Reactor, Heat and Mass Balance Considerations. 3.2.1. Heat and Mass Balances, Kinetics, and Reaction Stability. 3.2.1.6. Effect of Surrounding Temperature on Stability. 3.2.1.7. Effect of Agitation and Surface Fouling on Stability. 3.2.3.1. Heat Transfer in Nonagitated Vessels. 3.2.3.2. Heat Transfer in Agitated Vessels. 3.3. Acquisition and Use of Process Design data. 3.3.2. Bench-Scale Equipment for Batch/Tank Reactors. 3.3.2.6. Vent Size Package (VSP). 3.3.2.7. Reactive System Screening Tool (RSST). 3.3.3. Process Safety for Reactive Systems. 3.3.3.4. Malfunction and Process Deviation Testing. 3.3.3.6. Results from the ARC, RSST, and VSP. 3.3.4. Scale-up and Pilot Plants. 3.3.4.6. Scale-Up of Accelerating Rate Calorimeter (ARC) Results. 3.3.4.7. Scale-Up of Vent Size Package (VSP) Results. 3.3.5.1. Batch and Semi-Batch Processing Plants. 3.3.5.2. An Example Involving Peroxides. 3.3.5.3. An Example Involving a Continuous Nitration. 3.3.6.1. Scale-Up Example for Storage. 3.3.6.3. Passive Means to Prevent Explosions. 3.4.1.2. Determination of Gas-Vapor Release. 3.4.2. Instrumentation and Detection of Runaways. 3.4.2.1. Methods of On-Line Detection. 3.4.2.2. Methods of Noise Suppression. 3.4.3.2. An Example Involving a Sulfonation. 3.4.3.4. Dispersion, Flaring, Scrubbing, and Containment. Chapter 4. Management of Chemical Process Safety. 4.1. Hazard Identification and Quantification. 4.3. Chemical Process Safety Management.